Wow… time sure does fly! Here I am only a few months away from our wedding in September with almost everything checked off the list. I’m starting to feel more like a wedding expert than just a bride- can any other brides relate? So now that I am a “professional” on all things bridal, I thought I would backtrack a few months to one of the best wedding dress shopping experience I had. Experts only recommend the best of the best, right? 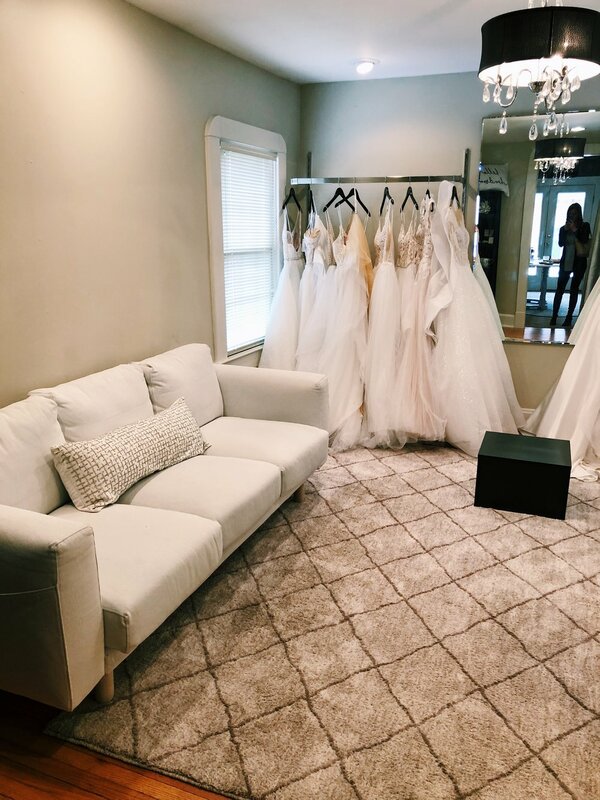 My second stop on my wedding dress expedition was Blue House Bridal located right in the heart of downtown Carmel, IN. As everyone knows now, I have been deemed quite indecisive during this whole process… changing my date three times and all. But Blue House’s ever-so-patient, girl-boss of an owner, Brittany Overbeck, stopped at nothing to help me find my style. I felt like I made a friend the second I walked in! Like usual, we discussed budget and a basic idea of what I was looking for but I loved how she went the extra mile to really capture the vibe I was going for. My style is something unusual sometimes, so it was a sigh of relief to have someone know exactly how to capture it. Brides who are still confused on what they want and are still struggling to determine their style- this needs to be your first stop on your wedding dress journey. Kapeesh? Anyway- at Blue House, I discovered a number of wedding dress styles that I previously would not have picked. In this case, I unearthed my love for the scalloped neckline. I have always been a strapless girl. Read my last wedding dress experience blog if you’re in doubt about my previous obsession. But all credit goes to Blue House for helping me find my new love, the scalloped neckline. (Hint: the wedding dress I ended up choosing which is not featured IS scalloped and not strapless- thank you, Brittany, for opening my mind!). I also discovered that I love ivory dresses rather than cream which I never thought would be possible. To be honest, I really did not understand how the tone of your wedding can completely change with the color of your dress. Even though I found that I am more of an ivory girl, Blue House has got tons of beautiful cream dresses too if you decide that’s what you want to rock on the big day. Another thing that I loved about Blue House Bridal is the vibe you get when you walk in. It almost feels like a place that you would get married, making the dress try-on more realistic. I told the fiancé over and over again how much I wished he could have been there (no worries though- the dress is still under wraps and he is still not allowed to wedding shop with me). When wedding dress shopping, your experience is everything. If you feel invited and comfortable in the environment that you’re shopping in, it is so much easier to find “the one”. At Blue House Bridal, you get just that- a welcoming environment with people who genuinely care about helping you find the dress of your dreams. · Do your research and have an idea of what you like before coming in. It may change, but at least you have a reference point. · Determine who you want with you at least a couple weeks in advance- I brought a few girls from my bridal party who were available and a couple of close family members. · Determine your budget in advance. You don’t want to be sticker-shocked when you think you’ve found the one. Blue House has a wide range of prices so don’t be afraid to be open with your consultant before trying on. · Be open-minded. You never know what you are going to find! Strappy scalloped neckline? I think yes.